A fast-paced day at a busy restaurant, or cooking for a family of hundreds? Maybe you’d like to hone your talents at a fine dining spot or even use your skills to travel. The opportunities for professional cooks are as varied and exciting as the dishes they create. A Professional Cook 1 (PC1) certification can be the first step towards a Professional Cook 3 or Red Seal qualification, but the PC1 is also a respected credential in its own right, opening doors across the culinary world from restaurants, hotels and resorts to institutions and catering operations. Earls, for example, is a major employer of PC1s. The premium casual restaurant chain has a detailed training program that immerses apprentices in every aspect of running a restaurant, from knife skills to food quality, organization and costs. “They learn what it takes to run a busy restaurant,” says Simon Zanotto, Head Chef at Earls on Shaughnessy in Port Coquitlam. Among those apprentices was Evan Leggett, a grade 12 student at Tamanwis Secondary in Surrey who achieved his PC 1 this year. Through the ACE IT (Accelerated Credit Enrolment in Industry Training) program he was able to attend classes taught by a certified cook instructor during the day and work at Earls after school and on weekends. Leggett’s long term career plan shows just how far a professional cook can go: he’s aiming for a job cooking on a coast guard arctic ice breaker. Career opportunities also abound in institutions, such as hospitals and care homes, where three meals a day, plus fresh baking, help create a homey environment for residents. Seniors’ homes in particular are putting a greater focus on quality food than ever before and, thanks to an aging population, the need for cooks appears set to grow. 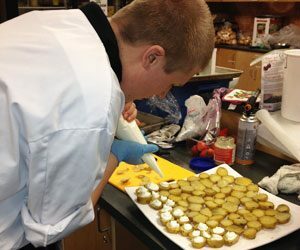 For example at Tabor Village, a care facility in Abbotsford, a team of Red Seal chefs and PC1 apprentices provide homemade meals for a community of about 400 clients. “It’s a great place to learn a wide range of culinary skills, as virtually everything, from fresh bread to perogies, is made in-house; cooks also learn to adapt meals for clients with special diets and health concerns. There’s plenty of room for creativity too, as menus are created in house and the staff do their best to cater to special requests,” says Joanne Jasienczyk, the Director of Nutrition and Food Service at Tabor Village. Of course, great food makes a difference to just about everyone, and whether you’re working in a seniors’ home, a restaurant, a hotel, a resort, or even an arctic icebreaker, as a PC1, you’ll be a key part of that business’ success! This article may be republished for non-commercial purposes subject to the provisions of the Website Use Agreement. To republish this article, you must include the following notice along with the article: "Copyright © 2019 go2 Tourism HR Society. All Rights Reserved. Republished under license."